Early in the morning, we took the highway to Marrakesh, after 2 weeks of beach and waves, we were finally in a city. In Morocco, the most common accommodations are the riads; there are different prices: from very luxurious suites to hostel-like rooms. So we stayed at a very intimate one called Riad Dar Ganou. To get to our riad we entered the Medhina — the old town of Marrakesh. One is not allowed to enter there by car. The Medhina is quite charming and chaotic at the same time. The markets —souks— are distributed along with riads, mosques, synagogues, and museums. This makes this old town a huge cultural experience. You share the streets with motorcycles, donkeys used for transportation, and bicycles. Walking through the Medhina, I discovered wonderful “little stores”. They looked like entrances to beautiful constructions, almost palaces. From the outside, what you can see are simply doors. If you cross those thresholds, incredible spaces await you. The Souk market is a bit more expensive than the one in Agadir. At this point, I am quite tired of the bargain ritual so we decided to discover more about the amazing architecture. That is how we found this beautiful mosque. At night, Leila and Lahoucine took us to the market right in the square outside the Medhina to have dinner. The dishes are quite traditional: soup and grilled meat and chicken, but the spectacle is great! The waiters are trying to get clients and every time they get one everyone claps and celebrates great entertainment. The following morning, we woke up early, had breakfast made by our amazing hosts, and we started our trip to the desert. 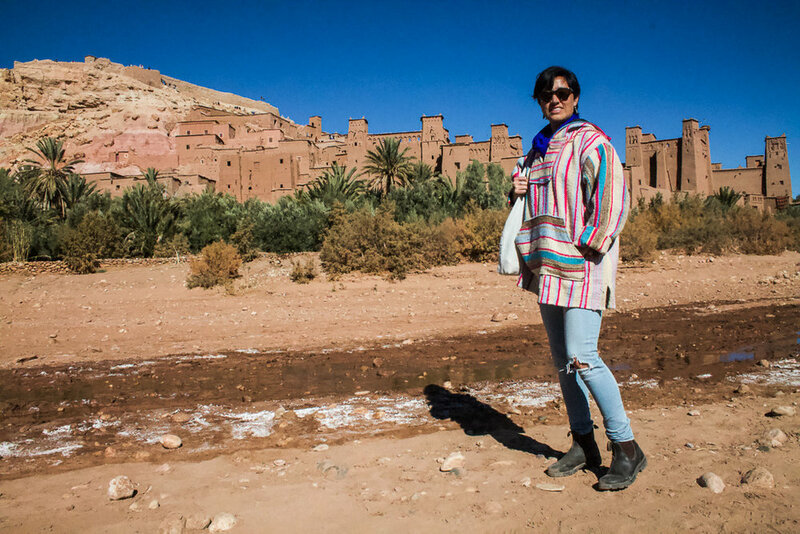 The first stop was a beautiful Berber village — Ait Ben Haddou. This beautiful town was built of sand and clay. Amazing! Then, we arrived at the Atlas mountains. Here the weather is quite cold, but the sun burns. Very impressive! The majority of the population is Berbers — a nomad population that used to live in the northern part of Africa. Nowadays, it is the 70% of the Moroccan population. The following day, before arriving in the desert, we visited a cooperative village where women make carpets, and men prepare food, a very rooted Berber tradition alive. Finally, we arrived in the desert. Wow, I can only tell you WOOOW! 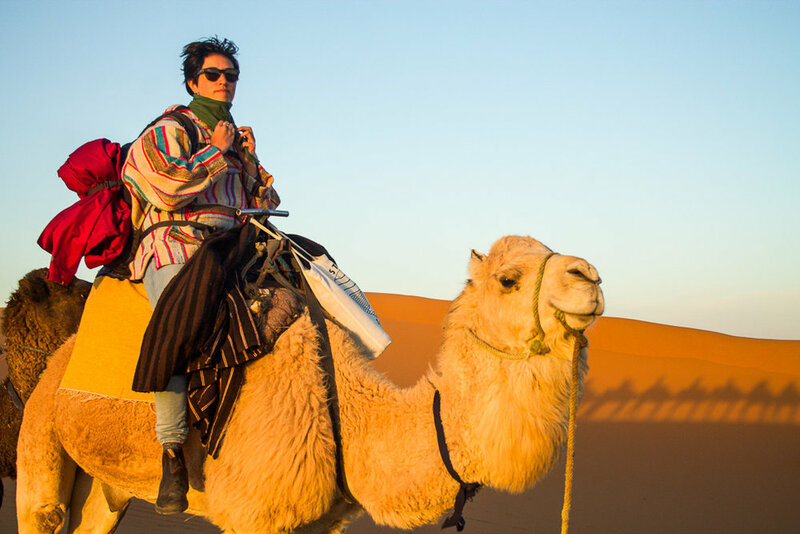 When we started our ride on the dromedaries, I thought I was dreaming. The sand dunes were fantastic. The color is so pure, and the sunset blew my mind... It took us about 1 hour to get to the camping place. Right in the middle of the desert, we had tea. Then the Berbers started a fire and sang some traditional songs (which sounded extremely familiar to me, because Lahoucin, our surf couch, used to sing them continuously. In the desert, you can see the milky way and listen to the sound of the wind on the wavy sand. It is just MAGICAL! Well the next day of this quick visit, we woke up at 6 and went back to Marrakesh passing through 1.5 m snow in the Atlas mountains, making the whole experience a bit surreal. Only to get back to Agadir to catch our flight back home. Honestly, I am still enjoying the magical experience of having been there!